Top Line Fence is a second generation owned family-operated business, proudly serving the Chicagoland area since 1972 and are leaders in residential & commercial fencing. We take great pride in helping both homeowners and business owners with all aspects of their fencing needs, whether you’re looking for a wood fence, wrought iron fence, chain link fence, ornamental iron fencing or any kind of fence repair. Our experienced contractors are ready to serve you, helping you install a new fence or make repairs on the one you already have. Whether you need a wrought iron fence, chain link fence, wood fence or fence repair, our team of highly trained professionals will help. 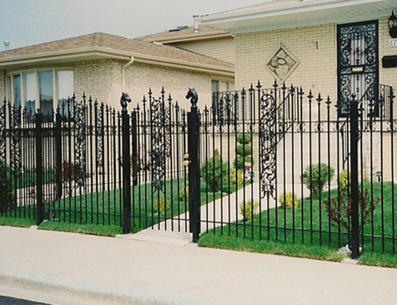 For years, we have served the homeowners and business owners of Chicago, IL, by providing them with the highest quality ornamental iron and fencing at the most affordable prices. Top Line Fence offers a full line of wrought iron railings and fencing, ornamental aluminum, ornamental iron, cedar wood, PVC vinyl, chain link, power operated gates and access control. We carry all custom styles and designs so you can choose the one that best suits your needs and creates the exact look you want for your home. Increasing the curb appeal of your home is easy when you invest in durable fencing. Once your fencing is in place, you can dress it up with things like wrought iron railings and other ornamental iron pieces. If you are not sure about what you need, call our fence company today to schedule a consultation. Our team will come out and take a firsthand look at your property. Once we have the layout of your home’s exterior, we can suggest ideas for your new fence. With our help, you will get a durable and aesthetically pleasing fence in a timely manner. When you use us for your fencing needs, you can rest assured it will be done the right way the first time around. 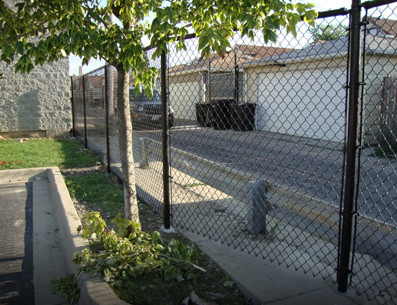 At our fencing company, we offer all types of security, chain link, corrugated and ornamental fences that are ideal for all types of businesses throughout the Chicago area. If you are a business owner, it is important to reach out to the right fencing company to secure your workspace. The team at Top Line Fence can install a fence around your commercial building. Our team of skilled fence contractors will survey your commercial building before starting any work. By doing this, we will figure out what type of fence is the best option for your needs. If you want to have complete control over who can enter your commercial building, a security gate is a great option. Not only can our fence company install these gates, but we can equip them with motion sensors. These security gates can also be hooked up to access control systems. This means only the people in possession of an access card can get in your building. If you are tired of worrying about the security of your home or business, now is the time to install a new fencing or security gate. When in need of fence companies nearby to help with the construction of this fence, look no further than Top Line Fence. We serve the residents of Chicago, IL, and the surrounding areas and can provide you with the fence you need at the right price.